Globe vs Smart iPhone 6s and iPhone 6s Plus Plans: What's the better deal? Globe and Smart dropped their own plans for the iPhone 6s and iPhone 6s Plus before the November 6 release. As we anticipate this availability, most of you might be wondering what’s the best deal for the Apple's new crop of iPhones. Of course, both telcos have already bombarded us with their initial offerings of the iPhone duo; and just to cure our itch for comparison, we have made a table of their respective plans alongside their bundled services. Smart is offering the iPhone 6s at Plan 2000 while the iPhone 6s Plus on Plan 2499. On the other hand, Globe markets the iPhone 6s at Plan 1799 with Php 450 monthly cash-out and iPhone 6s Plus at Plan 1799 with php 650 cash out, both comes with a 24-month lock-in period. We have plotted the complete details below. 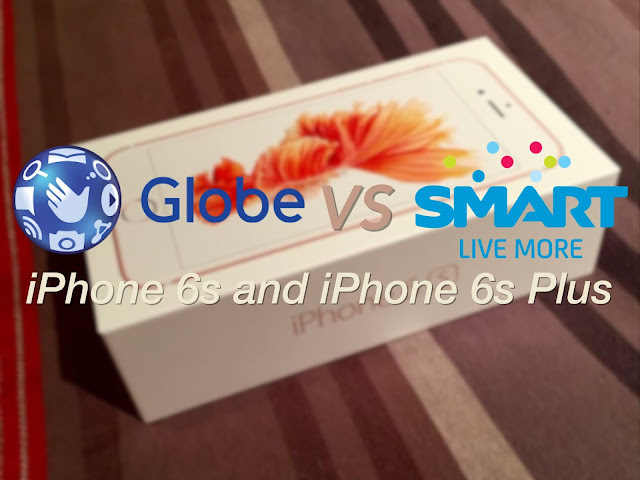 Globe iPhone 6s versus Smart iPhone 6s: What's the better plan? Of course, the answer to this question depends on several factors that we have detailed for you right after the jump. Globe offers the iPhone 6s for only 24 months which is basically less flexible compared to Smart's 24 and 30-month lock-in period. Comparing both 24-month plan, Globe is cheaper by a hairline of Php 24 if we are to account the total service price (Php 54000 of Smart versus Php 53976 of Globe). Moreover, Globe's 24-month iPhone 6s Plus plan is still cheaper with a total contract price of Php 58,776 compared to Smart's Php 59,976. Though we agree that both 24-month lock-in pricing are basically the same, we also believe that the bundles will be the major deciding factor. First we'll discuss the most popular bundle - the multimedia packs. Globe partners with HOOQ which gives you three months of free access and 1GB of data streaming. On the other hand, Smart's iFlix also gives you three months of free access with the same 1GB of free data streaming. It is also worth-noting that Globe's 1GB free data is shared with Spotify Premium and Game Packs (i.e. Clash of Clans, Hay Day, etc. ); while Smart's 1GB free data is solely for iFlix. If you love watching movies in your device, the exclusivity of the 1GB free iFlix data is a welcome bundle. But if you're flexible enough to allocate what part of the whole 1GB data consumption goes to what service, Globe's offering will be more convincing. I am a user of both myLifestyle Plan and Data Plan 2000 (with 150-minute calls and 200 texts). Based on experience, I could care less of my calls and texts when I'm with Smart due to the fact that I'm a moderate user. I find the freebie optimized since I have the flexibility to call and text to all networks. Of course, that does not apply to all. On the other hand, Globe Plan 1799 comes with unlimited text not just to Globe and TM, but to all networks. This means that you don't need to avail the AllNet text 299 pack to enjoy unlimited texts. Any calls outside Globe's network is subject for a fixed rate. However, if your contacts are in the same Globe-TM platform, this bundle will be very useful. The 10GB mobile data allocation is just right for a moderate user. But the additional 5GB for Smart's iPhone 6s Plan 2499 is also a breath of fresh air. If you reach the limit of 10GB worth of data, Globe will charge Php 2 per MB of use. This will be deducted from your account's available consumable amount and/or be charged on top of your monthly plan. Smart, on the other hand, will charge you Php 5 per 15 minutes of streaming and downloading. Other basic internet activities will still be free in their All-Month surf feature. Choosing a plan depends on how you intend to use your device. Should you use an iPhone 6s' (iPhone 6s Plus') bundled data as your main internet connectivity? You need to consider the data options. Smart's Plan is very convincing with its All-Month surf pack for basic internet activities beyond your data cap. Globe, on the other hand, has a very useful anti bill-shock system wherein it'll freeze your data charges when you reach Php 700 (for 10GB plan) on your bill. If you breathe with calls and texts, Globe gives you unlimited SMS service to all networks. Calls to other network will remain charged. While Smart's bundled AllNet calls and texts, depending on your plan, is very useful if you're a moderate user. When it comes to freebies, both camp have similar offerings for multimedia consumption. Globe has an edge over Smart for the 1GB of GlobeCloud Storage. However, I rarely use this freebie due to the availability of better free cloud storage in the market. Pinoy Metro Geek: Globe vs Smart iPhone 6s and iPhone 6s Plus Plans: What's the better deal?